With the XC40, Volvo now boasts a trio of SUVs. Updated May 25, 2018 to include revised cargo space capacity and fuel economy ratings. You can now put Volvo Cars on your luxury SUV shopping list if it isn’t already there. This spring, the third utility vehicle from this Swedish brand debuts when the 2019 Volvo XC40 arrives on dealer lots. The XC40 is important for Volvo for a number of reasons, but especially as it enables this automaker to supply consumers with a full line of utility vehicles. 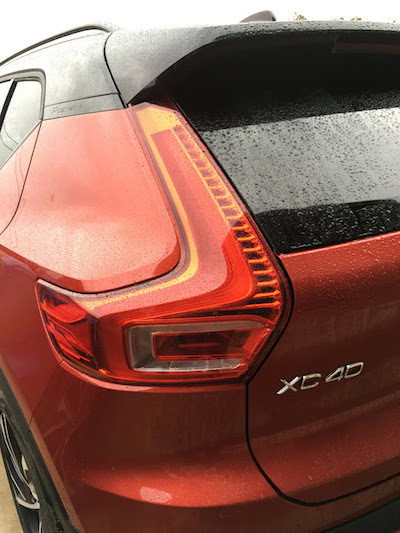 The 2019 XC40 is a compact model, which joins the midsize XC60 and large XC90 crossovers in thoroughly covering the segment. Further, the new Volvo vehicle targets the three top German makes, with the Mercedes-Benz GLA, Audi Q3 and BMW X1 the models ideal for that comparison. 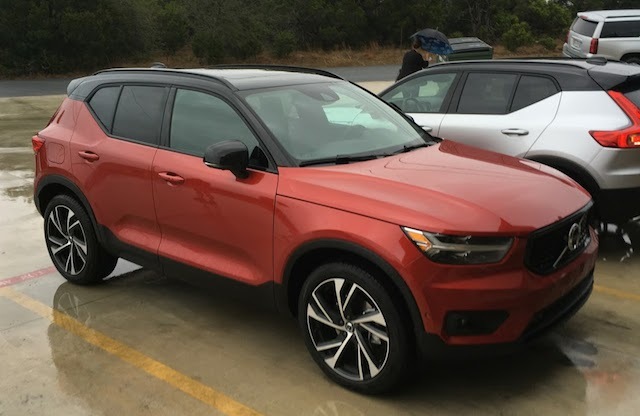 The 2019 XC40, the latest SUV from Volvo. This week, journalists were invited to Austin, Texas, for a media introduction and drive event. The morning excursion covered city routes with several “cultural” stops to take in, including furniture making, fashion and music. There was a definite tie-in Volvo wanted journalists to experience with these stops, including the SUV’s storage, the materials used and audio options, the latter amplified with its available Harman Kardon sound system. 1. SUV beauty, smaller scale. Volvo managed to capture the handsomeness of its two other SUVs and apply it to a smaller footprint. The brand’s recognizable grille with Volvo insignia is pressed in by beautiful headlamps with Thor’s hammer accent lights. The profile is somewhat different from other Volvo models as the beltline rises sharply to the rear roof pillar at the rear door handles. From the rear, you’ll find the expected boomerang tail lamps. 2. All-wheel drive is standard. At launch, all 2019 XC40 models have all-wheel drive. We expect a front-wheel drive model later, but for now you get all-wheel drive and your choice of Momentum and R-Design trims. An Inscription trim rolls out later this year. 3. Competitively priced. Volvo wades into shark-infested waters with the XC40, taking on the three German brands already mentioned as well as Infiniti, Lexus, Acura and LandRover. Volvo’s $35,200 starting price for the 2019 XC40 supplies the market with a similarly valued and sized product as its competitors, while enabling it to claim a few features not available or costing extra in the other models. 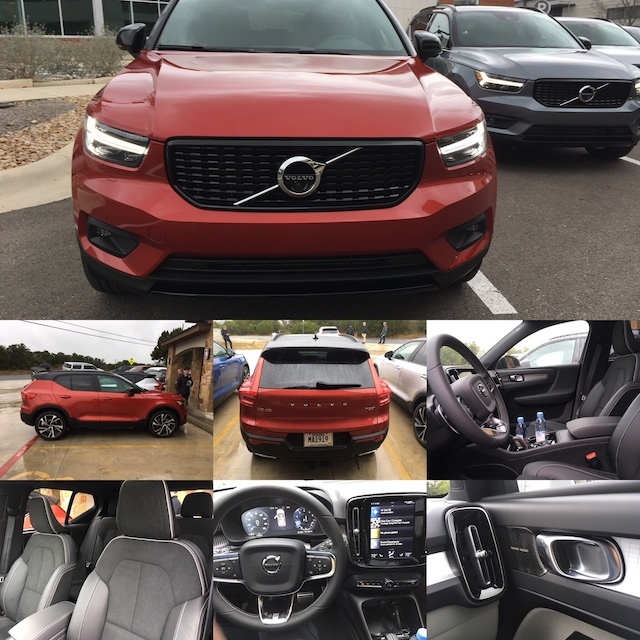 Specifically, the XC40 offers standard remote engine start, LED headlights, leather seats, Apple CarPlay and Android Auto compatibility, and lane-keeping assist. 4. Luxuriously appointed. Volvo interiors are beautifully designed and covered in a variety of materials, including leather and metal deco. You’ll find such items as a 12.3-inch digital drive display with navigation, a 9-inch Sensus Connect touch-screen, 8-way power front seats, a nifty front storage compartment (divided between tissue box and trash bin receptacles) and even an integrated bag hook. The look and feel is clean, the design sensible and this SUV’s overall practicality evident. 5. One powertrain choice to start. Volvo has big plans for vehicle electrification, with hybrids and pure electric vehicles part of that mix. But in launching the new model, they’re sticking with the basics, namely a 2.0-liter turbocharged inline four-cylinder engine generating 248 horsepower and 258 pound-feet of torque. An eight-speed automatic transmission works alongside this engine. We expect a plug-in hybrid model in the near future and perhaps we’ll even see Volvo’s all-new three-cylinder engine make its way to the North American market. 6. A spirited drive awaits. Happily, the XC40 is no slacker, delivering ample off-the-mark acceleration and the requisite kick when you need it. Driving around town the XC40 delivered the expected leisurely ride with weighted steering and quick handling at the ready — ideal for making tight turns on narrow streets. Where this SUV shines is on the open road and that’s precisely the route we took for the second half of our day, navigating Texas Hill Country and passing through such small communities as Round Mountain, Johnson City and Dripping Springs. Narrow, twisty roads with the occasional stream crossing the same. Posted speeds of 70 mph and a nice selection of twisty and falling roads were present, including one wonderful switchback. Minimal body roll was detected — this SUV handles as well and it is as fun to drive as any model in its segment. 7. You can subscribe one. You’ve heard of financing or leasing a vehicle, but subscribing to one seems like a foreign notion. And it is, but not for long if Volvo has its way. With the 2019 XC40, Volvo introduces a third ownership option: subscription. The way this works is that creditworthy consumers can shop online, subscribe and take delivery of a new model. Working somewhat like a lease, consumers lock into a 24-month all-inclusive flat-rate program, one that covers all maintenance and insurance costs — all you have to do is purchase the gas. Moreover, Volvo will allow consumers to make one upgrade in the first 12 months and supplies a 15,000-mile per year driving allowance. The cost is the same no matter where you live in the US: $600 per month for the XC40 T5 AWD Momentum with Premium Package, Vision Package, Heated Front Seats and Heated Steering wheel or $700 per month for an XC40 T5 AWD R-Design with the Premium Package, Vision Package, Advanced Package, Heated Front Seats and Heated Steering Wheel, Panoramic Roof, Harmon Kardon Premium Sound and 20” wheels. Volvo expects a 10-percent take rate with the program and will carefully monitor it before rolling it out to different models. With a trio of SUVs for your selection, Volvo Cars now has a full-range of crossovers worthy of your consideration. The design meshes well with other models and the novel subscription plan could prove a dealmaker for some shoppers. 2019 Volvo XC40 photos copyright Auto Trends Magazine. All rights reserved.